I have been involved in teaching Mathematics & Statistics since my college days. I specialize in Probabilistic Machine Learning which is area involving Mathematics, Statistics & Computer Science. In last 5 years, more than 50 of my students got admission into Indian Statistical Institute and more than 50 students joined CMI, IIT, IGIDR, DSE and other premier Institutions. Besides reading I am actively participate in Quora, LinkedIn & actively helping students all over India to get them closer to their goal. Research Interest : Time Series, Econometrics, Stochastic Process Control, Data Mining & Business Analytics. Current Designation : PhD Scholar at Indian Statistical Institute, Kolkata. Previous Academics : MS from Indian Statistical Institute, Kolkata. BS from Bidhannagar College, Salt Lake City. Work Experience : Green Belt Mentor at PSPD Division at ITC Limited. ​Teaching Experience : Taught Data Mining to MPhil in Statistics Students at University of Calcutta. Taught "Data Analysis using SPSS" at National Institute for the Orthopaedically Handicapped (NIOH). Hobbies : Painting, Writings & Reading Magazines. 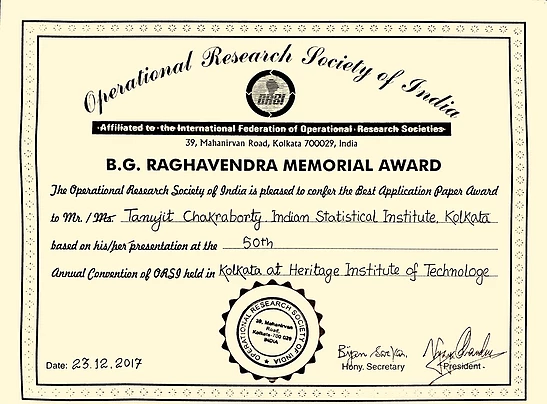 ​B.G.Raghavendra Memorial Award for Best Application Paper at the 50th annual Convention of Operational Research Society of India (23.12.2017). 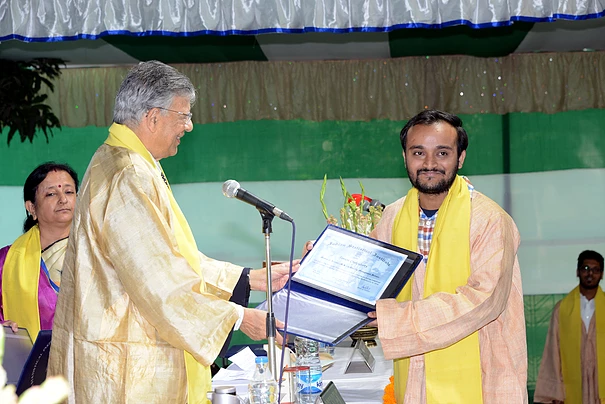 Junior Research Fellowship Award from Indian Statistical Institute. I am currently pursuing my PhD from Indian Statistical Institute, Kolkata. My research interest involved Pattern Recognition, Distribution-free Non-parametric Regression & some applied areas in Machine Learning. Prior to joining PhD, I did my Master's degree from Indian Statistical Institute & Bachelor's degree from Bidhannagar College, Kolkata. Being a Statistics learner & explorer, my goal is to teach the beauty of Statistics to the world. Prior joining PhD I was involved as a Six-Sigma Green Belt Project Mentor at ITC, Triveni. I love painting, poetry and music. Join me to explore the beauty of the key technology of modern century (Statistics). Student : What is the purpose of Ctanujit Classes Of Mathematics Statistics & Economics? Answer: Ctanujit Classes is dedicated for providing tuition & coaching for Mathematics Statistics & Economics entrances. Our blog provides FREE online Tutorial Section for different Exams. Our digital Library is to provide you FREE e-books. Our Correspondence Courses, Classroom Program & Online Classes are there to make your dreams come true to be a part of premier Institutes like ISI, CMI, IIT, IGIDR, DSE, JNU. Student : Who run Ctanujit Classes? Answer: It is an initiative by 'ISI'ians. We have area-wise faculties to maintain the standard at a higher level. Student : What is the background & history of Ctanujit Classes? Answer: Ctanujit Classes started its journey from 15th May, 2013. Our aim is to help people to get in ISI, CMI, IGIDR, DSE, JNU, etc. Free solved papers & reading materials are available for interested people & study materials & online coaching are also provided in minimal cost. Student : How do I contact Ctanujit Classes? You will get reply to your mail within 24 Hours. No communication over mobile is feasible. Student : What is the address of Ctanujit Institute? Where are the other centre in India? Answer: You can come to meet us only with prior permission from us through mail. We don't have any centre other than Kolkata. Student : What are the courses you offer? Answer : Postal Package & Classes for ISI BSTAT/BMATH, MSTAT, MSQMS, MMATH, MTECH EXAM. Student : Is the Payment procedure secure for buying Study material? Answer : Ctanujit Classes is a Govt. Enlisted Educational Institute. And the account number we have given, it's a current account opened in a nationalised bank. So, it's completely secure. Security Issues : You should keep the Bank Copy of Your Payment/ Internet Banking Payment Confirmation Copy & also copy of mail conversation so that if any dispute arises you can take legal step & these are sufficient enough to get legal helps from judicial system of Government Of India & also help from Consumer Forum. So, if you don't receive the package you can take regal actions. Student : What can I do if I won't receive the package? Answer : In some typical cases or remote locations it takes more than 7 days for us to deliver the study packages. But in most cases, it gets delivered within 7 working days. If somehow it can't be delivered at your place, then we will refund your amount in your bank account. Student : Is Cash On Delivery (COD) available? Answer : No. There is no scope of Cash On Delivery. Student : Can I buy package from there with cash payment? Answer : No. You can't. Our Bank Current Account is linked to West Bengal Trade Tax. So, we also encourage you for Cashless Transaction, and paying tax of our educational institute is also another good part of it for which we strictly suggest you to pay through Bank Transaction (Online/Offline). Student : Is the study materials sufficient for these entrance exams? Answer : These materials are efficient for these entrance exams. But buying study materials don't ensure you that yo will get chance in your preferable Institutes. Your effort & hard work are also needed with these materials. Student : Do you update course materials over years? Answer : Yes, we update the materials after each months. Many Things added over there. From 15th May, 2013 We started Our Journey. Now this is the 5th Edition of Our Study Materials are there for students. Student : What if I want to return the study package ? Answer : You can't return the study package once you bought it and received it at your given address. We being people from ISI have made the books for preparation of ISI Entrances. So, we believe they are highly useful. So, we won't encourage if you wish to return the package after buying it.